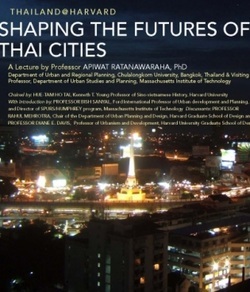 Recognized as one of the most prolific Thai urban planners in his generation, Apiwat Ratanawahara will discuss multiple challenges facing the futures of Thai cities in the next two decades. These challenges include population aging, foreign migration, economic integration with other Southeast Asian countries and China, large-scale infrastructure investment, and political, as well as administrative decentralization. The particular attention will be paid to the social and spatial implications of such trends, as well as the prospects for urban planning and advocacy in the country. Chaired by: Hue-Tam Ho Tai, Kenneth T. Young Professor of Sino-Vietnamese History, Harvard University; With Introduction by Bish Sanyal, Ford International Professor of Urban Development and Planning, MIT, and Director of SPURS/HUMPHREY program, MIT; Discussants: Rahul Mehrotra, Chair of the Department of Urban Planning and Design, and Diane E. Davis, Professor of Urbanism and Development, Harvard University Graduate School of Design Professor Apiwat Ratanawaraha teaches courses in urban planning and development, land policy and management, and technology and innovation policy at Chulalongkorn University in Bangkok, Thailand, where he is a professor of in the Department of Urban and Regional Planning. 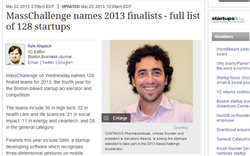 He also teaches Energy and Infrastructure Technologies at Massachusetts Institute of Technology (MIT). Apart from receiving numerous prestigious scholarships, grants, and research grants, he has served as a consultant and expert to both national and international development organizations. Ratanawaraha was a Harvard-Yenching Institute Doctoral Scholar (2000 - 2003) and Research Fellow in Science, Technology, and Globalization at the Belfer Center for Science ad International Affairs at Harvard Kennedy School (2005 - 2006). He received his B.Eng. from Tokyo University, M.Phil. from the University of Cambridge, and M.C.P. and Ph.D. from MIT. The Kendall Square Association’s (KSA) annual meeting on Wednesday — which included a keynote presentation by MIT President L. Rafael Reif — focused on ways MIT and others can foster, and benefit from, Kendall’s rising innovation ecosystem. Topics included the growth of Kendall Square infrastructure (mostly in the form of buildings for biotech firms) and initiatives to promote entrepreneurship in the district — such as MIT’s Kendall Square Initiative and the shared-lab facility known as LabCentral. The KSA is a nonprofit, with 132 member companies and organizations, dedicated to improving infrastructure, retail and pedestrian access in Kendall Square. 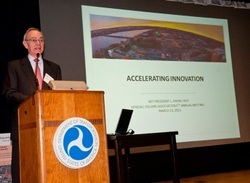 The group’s annual meeting was held in the John A. Volpe National Transportation Systems Center in Kendall Square. The Future for Market InsightsIn the not-too-distant future, social data (you know- all those tweets, status updates, comments, etc.) will take-off as a primary information resource for Enterprises. Our goal is to make it possible and easy for you to make sense of all that data. We’re not talking about some big IT Infrastructure-impacting, costly, hard-to-understand Enterprise application. No sir. Affordable, Instantaneous, Single-Purpose AppsWe’re talking beautiful, simple apps that will enlighten you and others who use them. In the background, we’re sifting and sorting through all the unstructured, massive data that your social audience has provided for you. In the foreground, you get beautifully-presented, killer market data that you can use right away. Take a moment to meet the friendly team behind this genius app. Transcendenz offers to connect our everyday life to an invisible reality, the one of ideas, concepts and philosophical questionings which the world is full of but that our eyes cant' see. 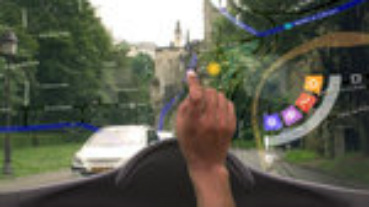 By bringing together the concepts of augmented/altered reality, Brain Computer Interface (BCI) and social networks, Transcendenz offers to live immersive philosophical experiences. Through meditation, users access the world of Interconsciousness, a white and silent universe in which they can connect themselves to the metaphysical experiences. These experiences transform our perception of the world and reveal an invisible philosophy. By making us aware of things like they are and not like they seem, the concept invites us to transcend our world. Transcendenz also enables us to access the knowledge of history's great philosophers, who, since antiquity, try to answer the question: "Why is there something rather than nothing?" Financial giant Capital One recently revamped their Arlington, Virginia location with the help of OTJ Architects. 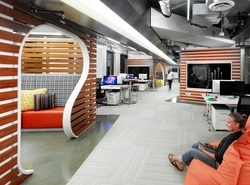 In order to create a more flexible and collaborative office, the designers created the space to be an Innovation Lab. “Capital One is the latest financial institution to take a laboratory approach to technology development, a strategy used by other institutions to explore new technology and see if it makes sense for their needs. The Capital One culture is rooted in a commitment to constantly innovate and work as a unified and highly collaborative team. In order to incorporate this culture, OTJ created a space that fosters deep collaboration and breakthrough thinking. OTJ designed an open and highly configurable and flexible space that supports collaboration and idea sessions. 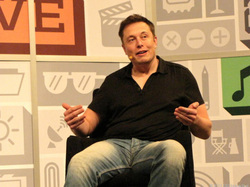 AUSTIN, Texas -- SpaceX and Tesla founder Elon Musk wowed a capacity SXSW crowd here today with the first public showing of a video of a rocket capable of blasting off and then returning safely and gently to the ground. And he later added he hopes to one day travel (perhaps one-way) to Mars. The video of the company's Grasshopper rocket, filmed just about a day-and-a-half ago, demonstrates one of SpaceX's key propositions: That it can develop reusable rockets at a fraction of the cost of a traditional NASA mission, and that it can bring them back down with the ease of a helicopter. According to a statement put out by SpaceX, the Grasshopper -- a vertical takeoff and vertical landing (VTVL) vehicle -- was able to "leap" to about 80.1 meters high, hovering there for about 34 seconds and then landing safely by using its closed loop thrust vector and throttle control, touching down more accurately than ever before. The company also said that the thrust to weight ratio of the vehicle was more than one, which it said was a key landing algorithm for SpaceX's Falcon 9. We’ve been hearing about a mythical Apple “iWatch” for a while now, to varying degrees of credibility, but this one from the April issue of MacUser magazine is probably the prettiest — and most plausibly Apple — interpretation we’ve seen. The design was cooked up by designer Martin Hajek — who’s done some spot-on renders for Gizmodo in the past — in close collaboration with the editors of MacUser. The goal was to make it something that they could realistically see themselves buying from an Apple Store, on a hunch that Apple would keep the design as “classic” as possible. The result is something far less visually offensive than some of the other concepts that have made the rounds. Google Glass fans who wear actual glasses will also be able to don the wearable tech, without abandoning their prescription glasses, according to a Team Glass post today. The company said one of the most asked questions about Glass was whether Google is making a prescription version. Clearly, Google has seen the value of making Glass versions for those beholden to their corrective lenses. "The Glass design is modular, so you will be able to add frames and lenses that match your prescription. 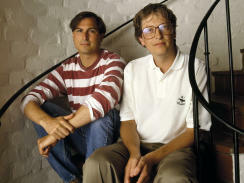 We understand how important this is and we've been working hard on it," Project Glass wrote on its Google+ account. 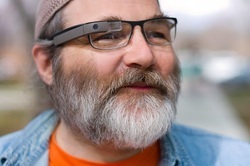 The team also posted a photo of Greg Priest-Dorman, a member of the Glass team, wearing a prescription Google Glass prototype.